The first two parts of the Intermission at the end of the Real route is the same as the end of the Super route. The only thing different is the last segment, but it garners us no new information. I'm only posting it for completions sake. : What... You didn't know? : I was at the Tesla labs... 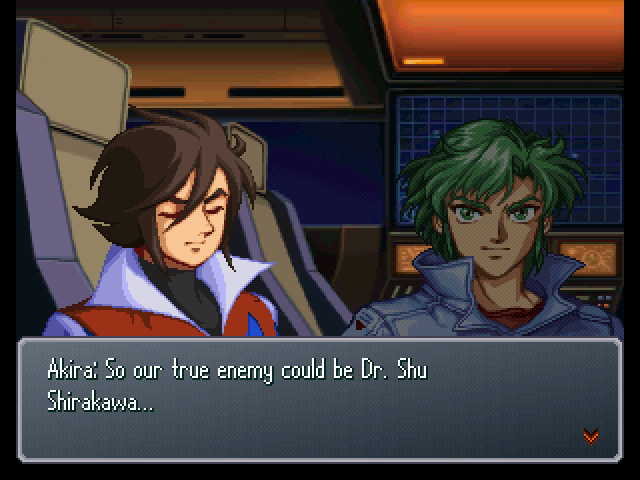 I only joined up with the South Atalia guys and Masaki after that. 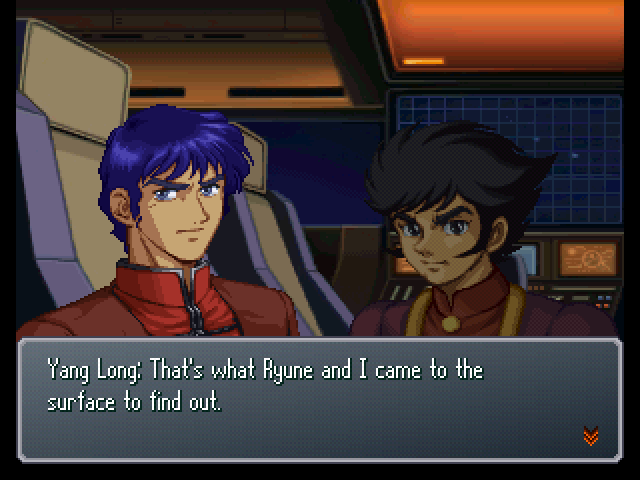 : Oh, no wonder, you weren't even in Japan. 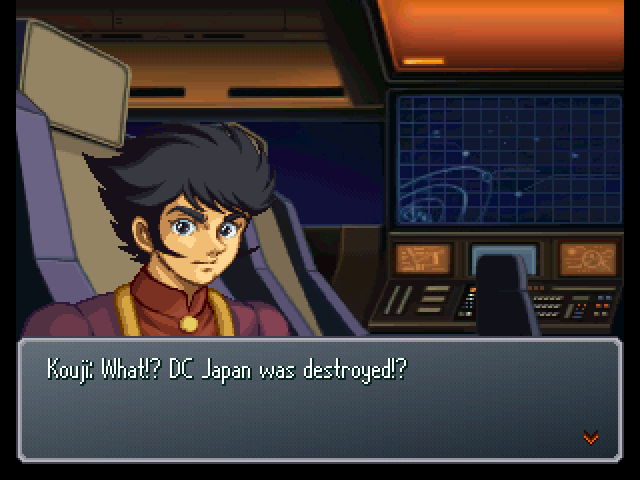 : But, Kouji... Wasn't the South Atalia DC branch destroyed, too? : Yeah. It was Shuu's henchwoman, Saphine. : The SRX team stayed behind there to follow up on it, but rebuilding's probably impossible. : The SRX Project machines also all either went missing or got taken by the Titans, I heard. : Hmph... And as always, it goes just the way Shuu expects. : (.........) He's got no further use for the DC, so he's obviously abandoned them. : So, what exactly is he after? : I'm Hwang Yang Long, an Elemental Lord operator just like Masaki over there. : An Elemental Lord pilot... Does that mean you're from that La Gias place? : But, Yang Long... Isn't that a Chinese name? : Yes, I was summoned to La Gias from the surface. : In any case, Shuu's been doing a lot of meddling around lately, and I don't like the fact that he's not showing up in person one bit. : Come to think of it, Shuu could've just been using us back in the Balmar War to get rid of the Aerogators. : And that's why he lent us his strength? : That's probably it. But, what I don't get is, why didn't he just bring the Granzon out to start with? : Probably to avoid tipping too much of his hand to Euzeth Gozzo. Like how we kept Great a secret until the Mycenae Empire began its invasion. : Yeah, there's no doubt he'll reveal himself before too much longer.